Almost a year ago I was writing my first assignment for the Stanford University course on Food Writing on a three course meal with lemons that were hanging on the tree in front of the ranch we used to rent. And I remembered how bitter-sweet were those days, leaving Mountain View behind but also leaving rentals in the past. So, now, in front of me I have oranges. Juicy, sweet, generous Sevilla oranges that abound in the backyard of my new family's home. For the first course I think about a salad dressing with oranges and curry. 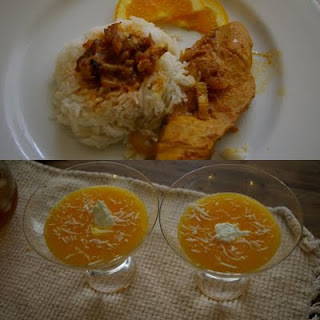 For the second a re-visited Paprika Chicken Breast and for the end a fruit soup composed by orange juice, peaches in conserve, coconut flakes and a dash of Greek Yogurt. The orange tones of the original source were all there as also the sweet and tangy notes in a more or less predominant note. The result of the meal were satisfied kids - all happy with the paprika notes- and happy adults. I wish I will be able to cook this meal for a long time and long life to the Sevilla orange tree! In a bowl mix olive oil, Greek yogurt, paprika, orange juice, and salt. Immerse chicken pieces and marinate in the refrigerator for at least 2 hours. Heat a skillet and stir-fry peppers, onion, and celery. When they start to get brown, remove chicken from the creamy marinade, reserving the marinade. Brown the chicken in the pan, then remove it to an ovenproof dish, top with reserved marinade, and bake at 350 F for 35 to 40 minutes. Serve with white jasmine rice and garnish with a half-slice of orange. Mix all ingredients and serve dressing in a small bowl. Use to season frisée or wild arugula leaves. In a blender, mix orange juice with drained peaches. Serve very cold in ice cream cups and sprinkle with coconut and a dash of yogurt on the top.